Through the adoption of contemporary international procedures, the Lebanese legal system in theory guarantees due process and fair trials. The justice system now allows for civil lawsuits without recourse to the Sharia, the right to legal counsel in any criminal case, and an absolute protection against “double jeopardy”—a defendant may not be prosecuted twice for the same crime. Despite these rights being guaranteed in national and international agreements, Lebanese criminal justice practices have not always held up to the rule of law. Although, maintaining the rights of an individual during their arrest is essential, it is equally important to protect their rights during court proceedings, detention and appeal. A violation in any part of the trial process endangers the concept of fair trial and undermines the rule of law. Lebanese society has always been skeptical about the fairness of trial. A focus group conducted by ALEF showed a generally negative attitude towards Lebanon’s trial system. Lebanese citizens found it highly unlikely to have a fair trial because of constant favoritism, socio-political connections (wasta) and nepotism. 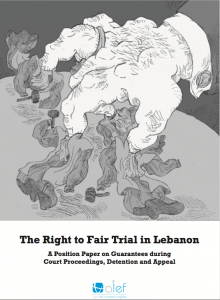 By expanding on the key components of fair trial, this paper will present and evaluate Lebanon’s judicial process.